The other day I was having a conversation with my son about our favorite board games. I was wondering just how important the theme of a game was for his enjoyment. I think the perfect game combines an imaginative and inspiring theme with finely tuned and engaging mechanics. But which one is more important for kids? I had my suspicions, but I wanted to find out. At that point we started to redesign games to decide if they sounded any more or less fun to play. For example, what if Race to the Treasure was about bees and racing them to their honey? Instead of flipping over ogre cards you flipped over bee cards. Everything else could be exactly the same. Then we realized that the theme is a huge part of our fun. We have fond memories of Race to the Treasure because of how terrified our son was of The Ogre. We used the theme to spark our imaginations - and on family walks I would pretend to be The Ogre and race everyone to the treasure waiting at our house. We changed the theme for a few more games, and my son and I quickly decided that the theme is always very important for us. The mechanics of a game obviously can’t be broken, but the theme is king in our house. King of Tokyo wouldn’t be nearly as much fun if we weren’t monsters trying to destroy each other with super powers. Without the rocket ship, the poisonous snakes, and the mole rat astronauts, Mole Rats in Space would just be a cooperative chutes and ladders. 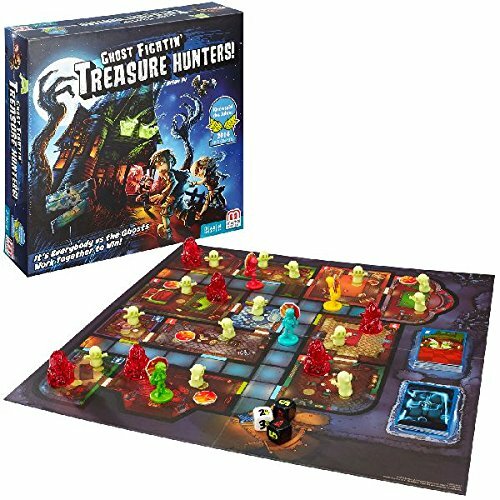 Knowing just how important a good theme is for us, I’m quite certain that someone crawled into my mind and made a board game just for me with Ghost Fightin’ Treasure Hunters. Regular readers will no doubt know by now how much I enjoy a spooky atmosphere in my books, games, and movies. Absolutely everything about family-friendly scares appeals to me. If something has a spooky theme, happy waves of nostalgia just crash over me, and I feel like I’m curled up on the couch watching A Disney Halloween. 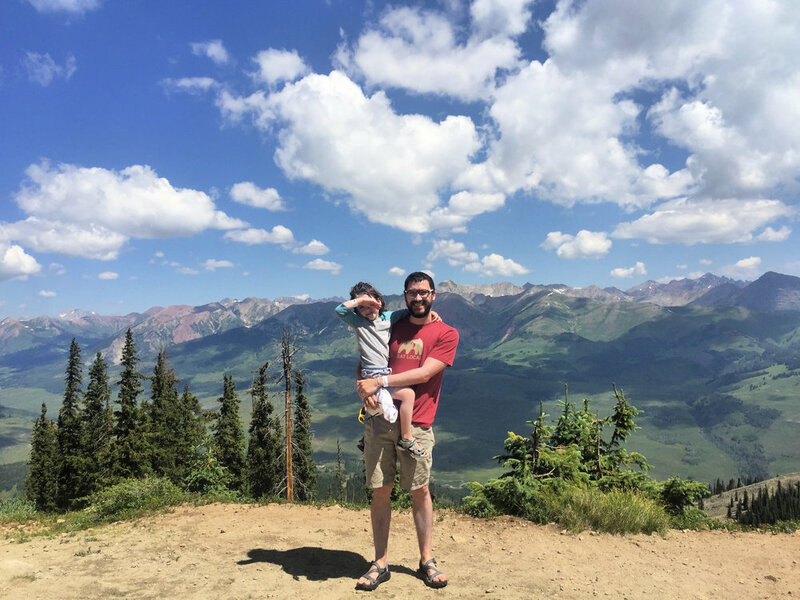 One of our family’s favorite video games to play together is Luigi’s Mansion, and Ghost Fightin’ Treasure Hunters makes us happy for many of the same reasons. The artwork and the ghost figurines are a very high-quality, cartoony style. The treasure hunters make their way through a haunted mansion searching for all of the treasure. They duck in and out of the hallways, into bathrooms and various bedrooms - and they’re bustin’ ghosts along the way. A bonus for us is that this is a cooperative board game - still our favorite way to play games. Either the treasure hunters get all of the treasure out of the mansion in time and you all win, or six rooms become haunted first and the treasure hunters are doomed! Every single turn comes with a chance to add a new ghost to the mansion, and if three ghost pieces (very awesome ghost pieces) are in the same room, they are replaced by a spooky haunting piece. You can fight the hauntings too, but you have to have two treasure hunters in the same room to do so. If six haunting pieces are in the mansion at the same time you lose. If you eventually find the main campaign to be too easy and you regularly make a clean getaway with all of the treasure, there are challenge cards to make the game harder. Some of the cards lock certain color doors and others require you to add more ghosts to the mansion. The jewels are also numbered on the back and you can require yourself to take them from the mansion in order. 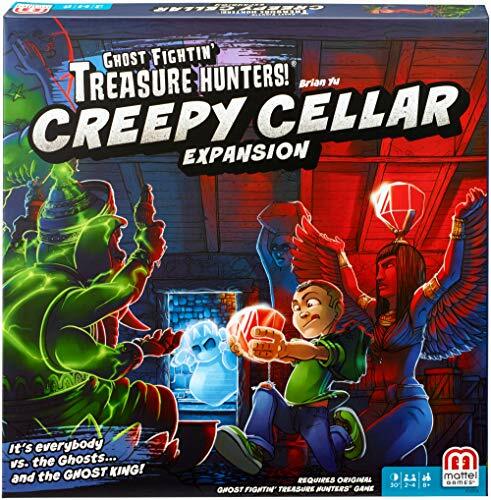 And there’s even an official expansion out now called Creepy Cellar that adds cursed treasures, a basement, and the Ghost King. But I have no shame to admit that the original version of the game - simply trying to get the treasures out by any means necessary before six rooms are haunted - is still quite enough challenge for us. Those cursed ghosts trap us in that mansion for all eternity quite a bit! 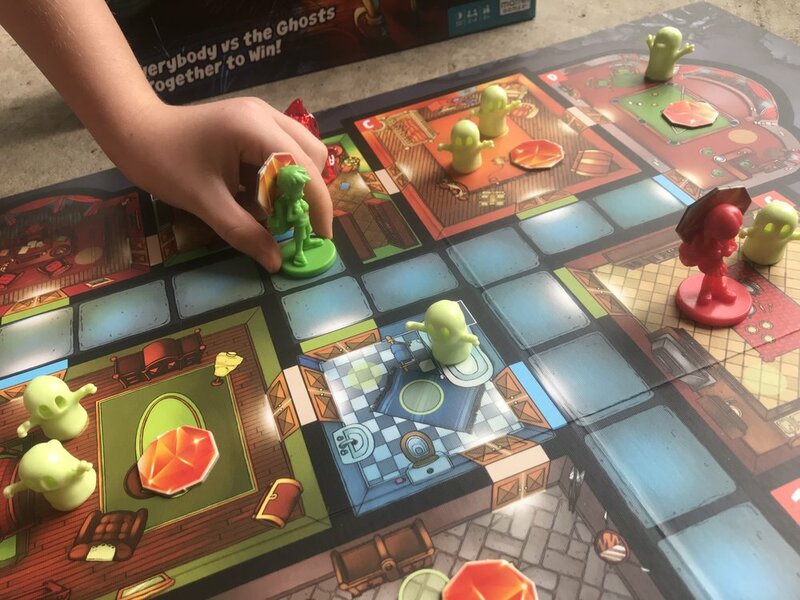 Ghost Fightin’ Treasure Hunters was created by Brian Yu and published by Mattel in Germany as Geister, Geister, Schatzsuchmeister, and it won the very prestigious Kinderspiel des Jahres 2014, or Children’s Game of the Year. This prestigious honor has such a track record that even being nominated for Spiel des Jahres or Kinderspiel des Jahres is basically all the recommendation we ever need. And did I mention how very high quality and awesome these ghost pieces are? This is by far the family game with the very coolest pieces and components that we own. In the end, thinking about how great this game looks brings us right back to why we love this game in the first place, and board games in general. The theme of this game lets us use our imagination - and the beautiful pieces are icing on the cake that helps us with the role playing. If a board game sparks our imagination we can take that experience and use it later in the backyard together. I can be The Ogre chasing everyone home to the treasure, we can all be giant monsters trying to conquer Tokyo, and now we can all pretend we’re treasure hunters, fighting ghosts together in a spooky mansion. It feels like we’re on co-op mode in Luigi’s Mansion in real life, and we’re all trying to make it out alive. When it comes to board games, are you more of a theme person, or a mechanics person? Has a good board game theme ever sparked imaginative play in your backyard? Let us know in the comments, and please tell us if you’ve tried Ghost Fightin’ Treasure Hunters yet.